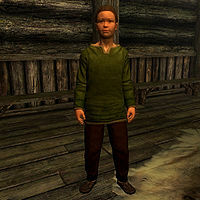 Hroar is a Nord child living at the Honorhall Orphanage in Riften. He was apparently named after the sound of a lion's roar. He is unhappy that Grelod the Kind is preventing the children from being adopted, saying that he would be "the best son ever" if he was given a new home. He approves of Aventus Aretino's plans to summon the Dark Brotherhood, and hopes Grelod the Kind will be killed. Once she is, he will cheer with joy along with the other orphans. If the Hearthfire add-on is installed, you may adopt him. He sleeps from 10pm to 6am. He wanders around the orphanage until 10am, when he goes outside to the yard for an hour to play with his friends. At 3pm they will have a one-hour meal. When you approach him, he may tell you about his name: "I was named after the sound a lion makes. You know: rrroooaaaarr! Really." He may also comment on the orphanage's adoption policy: "It's too bad the orphanage ain't letting us kids get adopted. I'd be the best son ever." If Innocence Lost has not been completed, he may beg you, "Please, mister/lady. You got to get me out of here. Ever since Aventus left, Grelod's been even meaner than usual. I swear, she's going to kill one of us." After Innocence Lost is completed, however, he'll be more contented, as he'll say, "I used to hate it here, but it's not so bad anymore. Constance is real good to us." If Grelod isn't dead, you ask him to tell you about her. He'll answer with "I ain't afraid of the old hag. Still, I wish Constance was in charge. She treats us real good." He'll continue by saying why: "Constance, sometimes she gives me little snacks. Which is good, 'cause we only get but one meal. Late, too, in the afternoon. I'm a growing boy. I need as much food as I can get." You can also ask Hroar about who Aventus is, and he'll respond, "Aventus Aretino? He only lived here for awhile. I think his mother got sick and died or something. Anyway, he's gone now. He ran away." If Grelod isn't dead, he will continue with "But Samuel told me he's back home in Windhelm, and is doing some kind of dark ritual. He's trying to summon some killers to come get old Grelod." If she is dead, he'll instead say, "But Samuel told me he's back home in Windhelm, and did some kind of dark ritual. He summoned killers to murder old Grelod. He's saved us all." Upon murdering Grelod the Kind, he and the other children can be found cheering on her death: "Whoa! They killed Grelod! Ha ha ha ha ha! ", "Someone has killed Grelod! Ha ha ha ha ha!" and "Hurrah! Hurrah!" To adopt him, first ask him to tell you about himself. He'll say, "I'm Hroar. You know, like the sound the lion makes? That's what my mother used to say. I want to be big and strong like a lion, too. Someday." You will have the option to adopt him. During a conversation, Grelod may order Constance to stop Hroar from crying at night: "Hroar's crying is keeping me up at night. I'll give you one chance to talk the tears out of him, or he's getting the belt." If you adopt Hroar and you have adopted another child, Hroar may disappear after some days. Using the console commands prid 19DE9 followed by moveto player may fix this problem. Hroar may continuously engage in dialogue with you, disabling you from doing things normally. He doesn't go to sleep or do his chores. The only way to get rid of him is playing hide-and-seek or tag. ? Esta página foi modificada pela última vez à(s) 15h47min de 24 de janeiro de 2014.